If you think bad credit isn’t a big deal — think again. The truth is, credit issues can have a crippling affect on all facets of your financial life. 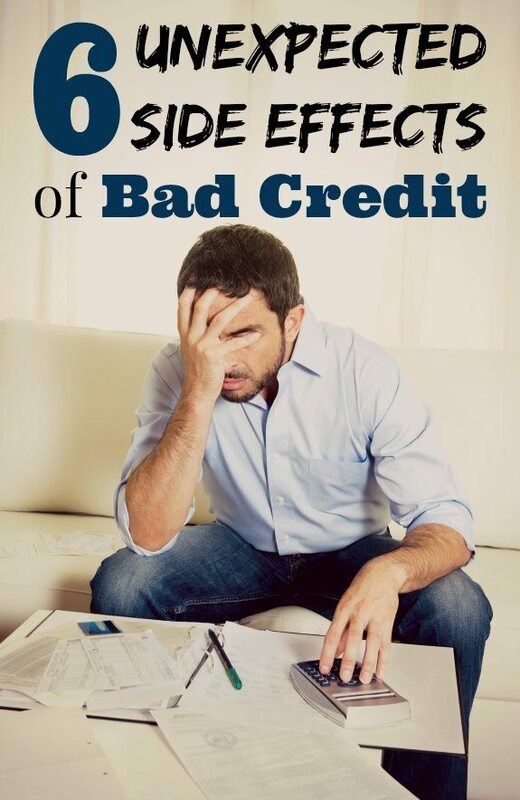 So, before you shrug off a low score, here’s a look at six side effects of bad credit. If you’re renting an apartment or ordering a utility service, the landlord and utility company will run a credit check. And unfortunately, if you have a low credit score, you might have to pay a higher security deposit. The deposit might be as much as two or three times the cost paid by someone who has good credit. It’s not fair, but it’s the price of bad credit. Nowadays, just about everybody needs a cell phone. But unfortunately, if you have a bad credit score, some cell phone companies will not give you a contract. You’ll have to get a pay-as-you-go phone plan, plus pay the full retail price of a cell phone out-of-pocket. This doesn’t always happen. However, if you apply for work in the financial industry, such as with a bank or credit union, or if you seek government employment, the hiring manager may run a credit check before offering you a position. From a company’s standpoint, if you cannot manage your own finances, how can you manage the company’s finances? Even after you’re employed, the company may run periodic credit checks. If your credit score drops after you’re offered a job, you might be required to repair your credit within 6 to 12 months, or risk losing your job. As if paying higher interest rates isn’t bad enough, some auto insurance providers run credit checks and charge higher premiums to those with low credit scores. The thought behind this is that people with good credit are usually more responsible drivers. You can maintain low and affordable premiums by improving your credit score. If you’re tired of going to work everyday and you want to start a business, you’ll probably need a business loan or a personal loan to get started. But unfortunately, with a low credit score, your chances of getting any type of loan are slim to none. You might qualify if you have a cosigner and plenty of collateral, but expect a higher interest rate than someone with an excellent credit history. Believe it or not, but your credit habits can affect your children’s lives. Think about this, if bad credit prevents you from buying a house or buying an automobile, this affects where you raise your children, and whether you’re able to have reliable transportation for your family. Also, if you have a low credit score, you might not be able to cosign for your kid to get a student loan, or help your child financially in other aspects of his life. If you’re tired of being penalized for past mistakes, now’s the time to get serious about your credit. You can repair your score on your own by paying bills on time, paying down debt and disputing errors on your credit report. But credit repair is a tedious job that takes patience and persistence, and you might be better off working with a credit repair company. These companies have experience helping many clients understand their credit rights, and they know the best “credit repair methods to employ when it comes to your specific credit situation,” according to Lexington Law. You’ll receive education on smart credit practices, and your score may increase faster than if you had repaired your report on your own. So, although you can skate through life with bad credit, it’ll be harder to do many things–from renting an apartment to getting a job. Rather than viewing bad credit as a way of life or optional, realize the importance of boosting your credit score and work with a company that can fix your situation and open the door to better credit opportunities. Thanks for pointing out these side effects of bad credit. I’m afraid many think that their credit doesn’t matter because they don’t plan to borrow money. So not true! as you aptly describe. Too many people think that bad credit is not an issue. It is not uncommon for financial guru’s to brag of their “zero” FICO scores. Good luck in renting, insuring and even opening a chequing account with bad credit.